Prohibition, which was in place between 1920 and 1933 and forbade the production, sale, and importation of alcohol, all but killed the vigorous spirit industry that had taken root in the United States until then. Most distilleries were forced to close. The ones that remained open, as did Buffalo Trace in Kentucky, were allowed to do so under special licenses to distill bourbon for medicinal purposes—only four such licenses were dispensed in the country, according to Buffalo Trace’s history. From 2000 legally registered distilleries, 63 remained in Kentucky after the Prohibition ended. All New York State distilleries closed. It took 70 years for one to reopen. Tuthilltown Spirits, the first legal distillery to open in New York since the Prohibition, is tucked away in the Hudson Valley, in Gardiner, NY, surrounded by fields and farms. 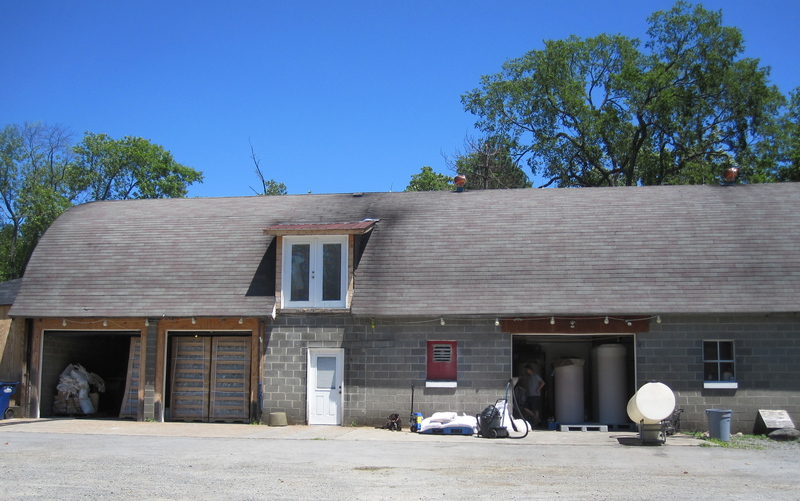 Just like its unmistakable bottles, the distillery is small—a converted barn that looks more like a large garage hosts the entire process, from milling to bottling. The barrels are aged in a two-story building that now also hosts a small tasting room and gift shop. Ralph Erenzo bought what was then a gristmill in 2001, with the intention of turning it into a climbing facility and hostel, explained his son, Gable Erenzo, who is a distiller and brand ambassador for the company. The neighbors, fearing that such activity would bring too much noise and chaos to the town, opposed it. The town’s code officer advised Ralph to open a winery instead, which would classify it as a farm and give it the Department of Agriculture and Markets’ protection. Ralph and his partner, Brian Lee, turned to distilling instead—a distillery also has farm status—and produced their first batch in 2003, obtaining their license in 2005. Tuthilltown benefited from a change in regulation in 2001 that made craft distilling possible in the state. Before that, the only license available was a $50,000-a-year industrial one, said Erenzo. For all of its complexity when it hits the tongue, bourbon begins simply enough—with grains. Rye, wheat, and malted barley are the typical complements to corn. Tuthilltown Spirits’ Baby Bourbon is made of 100 percent corn, while its Four-Grain Bourbon contains 60 percent corn and an equal proportion of rye, wheat, and malted barley. Maker’s Mark, by comparison, contains 70 percent corn, 16 percent wheat, and 14 percent malted barley, while Woodford Reserve is made of 72 percent corn, 18 percent rye, and 10 percent malted barley. Grains are milled into a fine flour, then poured in proportions specific to each bourbon’s recipe, one type of grain at a time, into large mash cookers with water. Each grain is then cooked to a specific temperature until the next one is added. This cooking process is called mashing. The mash bill then must be cooled down to 55 or 60 degrees before being placed in fermenters—at which point yeast, and often sour mash from a previous batch, to ensure consistency, are added—where it will remain for several days. The fermentation time depends on the distiller; Tuthilltown’s bourbon ferments for five days. One pound each of two types of yeast are added on the second day after being tempered in three gallons of water for 15 minutes. Mash is added to the bucket, and then poured into the fermenting vat. Fermenters at Tuthilltown have a capacity of 200 gallons. Small batch indeed: the industry’s largest tanks, at Buffalo Trace, contain 92,000 gallons. 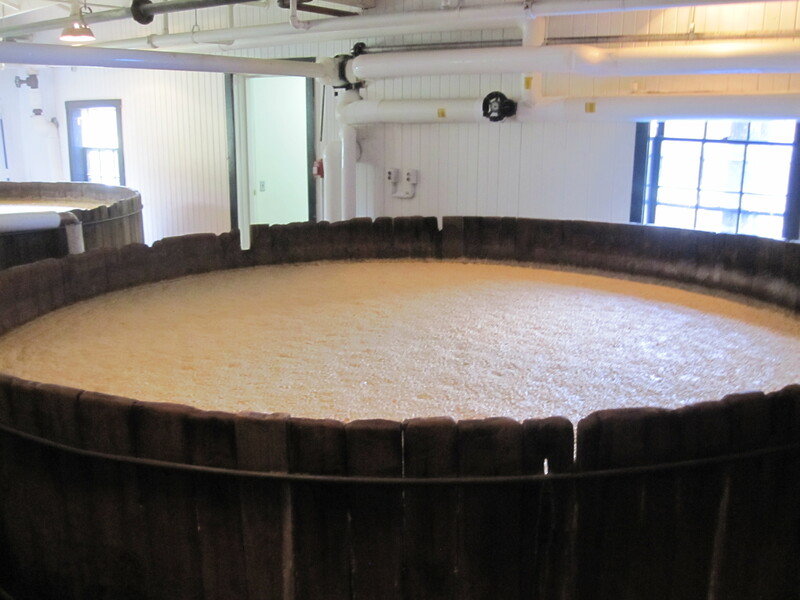 During fermentation, the mash is first sweet, then tastes like flat beer, and finally turns sour, at which point it is known as “distiller’s beer.” After fermentation comes distillation. The mash is placed in a still, the liquid is heated, and as it goes through several copper plates, the liquid comes down into a recipient. Most bourbons are distilled twice, as is the case at Tuthilltown. The distillery uses two German-made pot stills that allow them to create a number of different types of spirits, said Erenzo. The fermented mash bill sits in the pot while a steam jacket heats it up. The liquid then evaporates and goes through a series of copper plates. As it goes through the cold coil, it condenses back into liquid. During the first run—the stripping run—the bottom plate is closed and the “bad” alcohol disappears. The second distillation allows the “heads” and “tails” of the alcohol to dissipate, so that only its “heart” remains, ready to be captured. After the second distillation, the bourbon reaches 78 to 80 percent of alcohol by volume. The distiller adds water to bring it to 57 percent, at which point it goes into barrels. Two farmers grow wheat specifically for the distillery, while the apples used in its vodka come from an orchard three miles up the road. The malted barley comes from Canada. The enzymes it contains break the grains’ starches into simple sugars, said Erenzo. 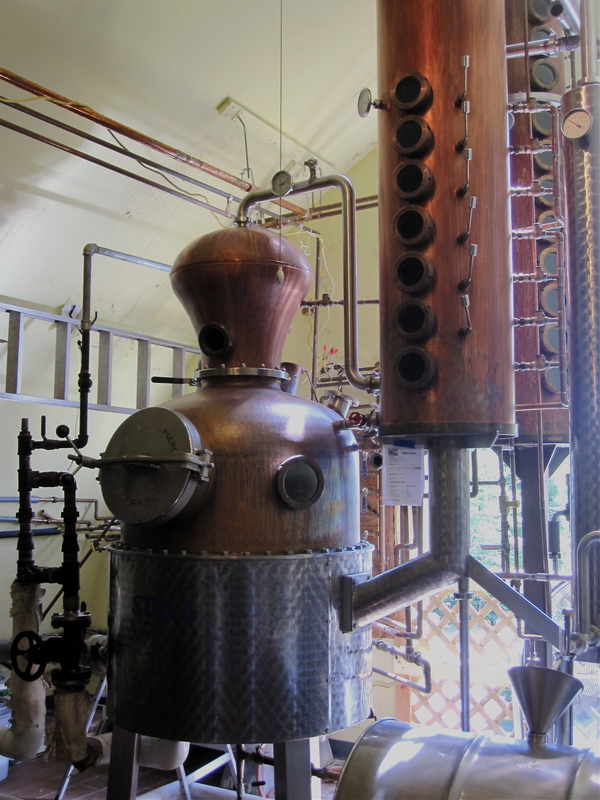 The distillery, which occupies 10 full-time employees, produces one or two batches a day, which each turns into about 50 gallons of finished spirit. Each bottle is filled, corked, and labeled by hand; the current year is also hand-written on the label. “We touch the bottles seven times before they leave the door,” said Erenzo. About 40 cases are bottled and packaged a day. No just any whiskey can be called bourbon. Its signature elements are carefully regulated. By law, a bourbon must contain at least 51 percent corn; be aged in new, charred oak barrels; be distilled to no more than 160 proof; go into barrels at no more than 125 proof; and be bottled at no less than 80 proof. Some distillers keep secret the exact percentage of grains and the temperatures used in their bourbon. No coloring or flavoring agents can be added. Kentucky distillers will tell you that the water of the bluegrass state is essential to the taste of bourbon. There, river water runs over limestone, which leaves it rich in calcium and magnesium and low in iron. In addition to being beneficial while cooking the mash, in Bourbon at its Best (Clerisy Press, 2008), Ron Givens writes that if the water that is added to bourbon after it is distilled—to lower the proof before it goes in the barrel—contains too much iron, a reaction with chemicals in the wood can turn the liquid anywhere from green to black. Tuthilltown uses water from a deep well. According to Charles K. Cowdery in his book Bourbon, Straight (Made and Bottled in Kentucky, 2004), rye was the grain of choice to make whisky in colonial times. This changed once pioneers settled in Kentucky, where corn was abundant. Evan Williams opened the first commercial distillery in 1783. Bourbon was placed in barrels and shipped down to New Orleans to be sold. The journey on boats down the Mississippi River took several months to complete, and by the time the whiskey reached Louisiana, it had begun aging. Initially the barrels were not charred. But in the late 1700s, Elijah Craig experienced a barn fire that charred his barrels. According to the history passed on while touring Heaven Hill distillery in Bardstown, KY, he filled and shipped them anyway. The whiskey that arrived in New Orleans was smoother and tastier than its previous incarnations. Cowdery offers a more simple explanation: Barrels were used to store all kinds of goods at the time, and so were charred in between uses as a way to sterilize them. He suggests that new barrels were charred as well because the process gave the bourbon a better taste. The practice seems to have been widespread by the mid nineteenth century. Four levels of charring exist, which refer to the length and depth of charring; Tuthilltown uses a no. 4 char. The barrels at Tuthilltown are part of what gives the distillery—and the bourbon—its unique character. Rather than using the large, 53-gallon barrels one will see in the larger Kentucky distilleries, Tuthilltown ages its spirits in barrels that contain between three and 14 gallons. A smaller barrel increases the surface of exposure between liquid and wood, explained Erenzo, and allows the bourbon to gain its distinctive taste much faster, without needing to wait 10 or more years for a full, smooth flavor. A three-gallon barrel ages in about 4 months, an eight-gallon barrel will age in about a year, and a 14-gallon barrel in two years. This is particularly crucial for a young distillery like theirs, since it means that product can be on shelves rapidly. As Tuthilltown expands its production, however, the distillers have begun using slightly larger barrels; five gallons is their smallest size now, said Erenzo. 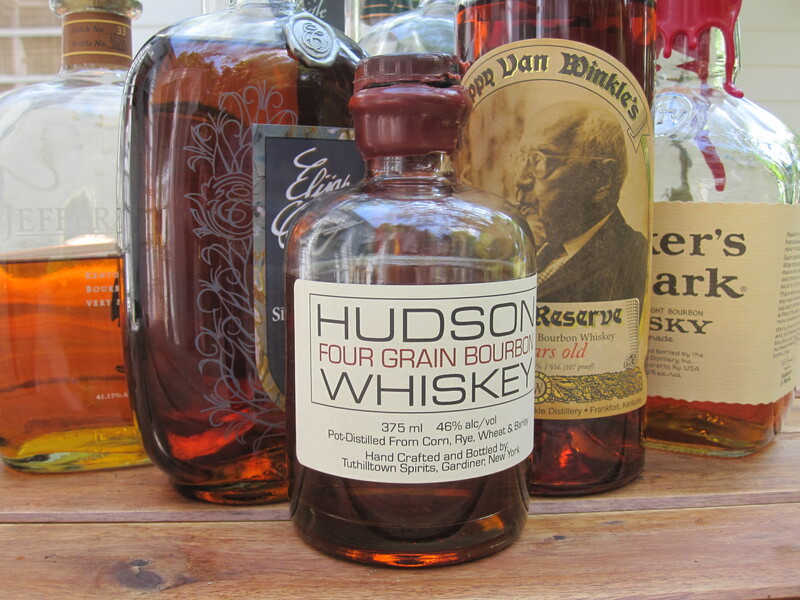 In June 2010, William Grant & Sons acquired the line of Hudson Whiskeys from Tuthilltown, which gives it an exclusive licensing contract for seven years. This will help propel sales of Tuthilltown’s whiskeys in Europe and generally help further develop the company. 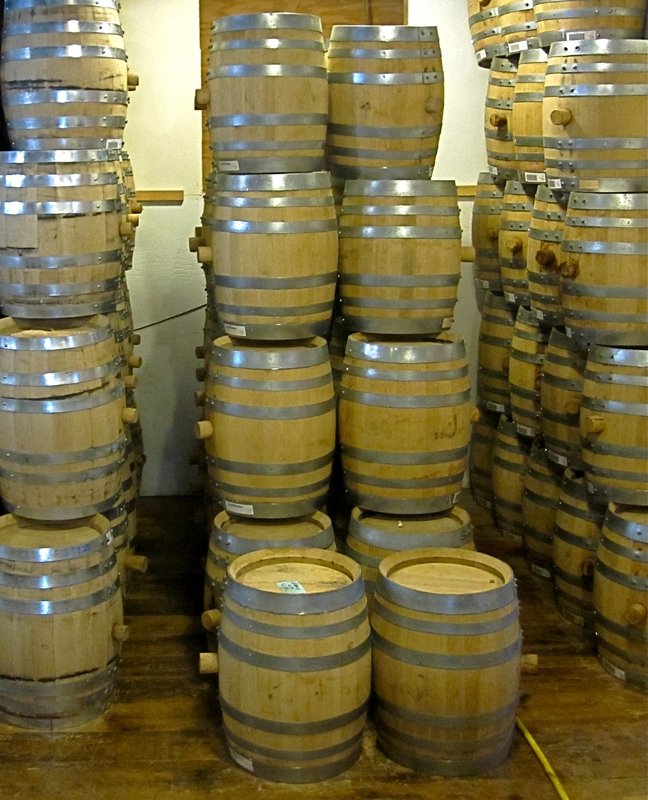 Smaller barrels are more cost prohibitive. The production of each gallon in a three-gallon barrel is between $25 and $30, while it goes down to $3 a gallon in a 53-gallon barrel, Erenzo added. According to the Distilled Spirits Council of the United States (DISCUS) 2009 Industry Review Tables, sales in the bourbon and Tennessee whiskey category were up by 0.3 percent last year—not a significant number, but one that. However, one just needs to take a look at the bourbon shelves in a well-stocked liquor store to realize how many small batch, high-end bottles are now available. Kentucky distillers also know that bourbon is popular, as they see more and more tourists visiting from all over the country and develop their public offerings to tap into that demand. The Kentucky Distillers’ Association offers an official bourbon trail, which features six distilleries that pay to be included. Tourists receive a “passport” to be stamped at each distillery and traded, once completed, for a T-shirt. No need of a passport to visit Tuthilltown, which offers two tours for the public on Saturdays and Sundays year-round. State laws also allow the distillery to pour ¾ ounce per person. With the ¼-ounce pours served in the tasting room, each visitor can try three of the distillery’s products, from white dog (whiskey straight from the still) and bourbon to rye and vodka. This article first appeared in fall 2010 issue of The Main Course, the newsletter of the Institute of Culinary Education.